Let’s all welcome back our favorite beautiful tropical fish, Heather, who was kind enough to review this week’s episode of Parks and Recreation while I finished my latest Once Upon a Time essay! Two Sentence Summary Leslie encounters some problems with the Pawnee-Eagleton merger and receives an interesting job offer, while Tom finds an investor who believes in his ideas. Meanwhile, Ron volunteers to fix a floor of City Hall while his newborn son watches. My Thoughts What a beautiful and hilarious episode. I cracked up at multiple points during the episode—not necessarily because the lines or reactions were so funny on their own, but because they were so perfect for the character. From Leslie’s response to Ron getting a fish to literally all of Ben’s reaction faces to Craig demanding that someone follow him because he was distraught, this episode used our knowledge and love of the characters to produce some genuinely funny moments, and I think that’s pretty good for a show in its sixth season. It was also an episode of successes. We have been watching Tom bounce from idea to idea and increasingly become less satisfied with his job as a government employee. He has so much passion and energy, but it’s not always accompanied by sound business ideas. I actually really love the idea of him as a fundraiser, especially for something that he can be passionate about. My office’s goal is to raise money for a university, so I am surrounded by fundraisers and see a lot of similar qualities in him. That being said, fundraising will never be Tom’s dream. He wants to see his business ventures succeed and to feel proud of what he’s done to make them succeed. I am thrilled to see someone recognize his passion and be willing to really invest in Tom as a person to make those dreams a reality. I wish he would recognize the value that Ben adds to business discussions a little more, but that’s partly my love for Ben speaking. After a disappointing week trying to get people excited about the merger, Leslie received one of the biggest compliments of her career. She was told that her grant proposal was used as an example and praised for its thoroughness by the “bad boy” of the Department of the Interior, and she was offered a job with the National Parks Service. 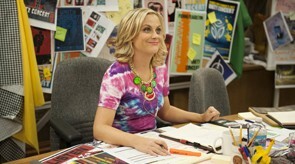 Though she ultimately decided to stay in Pawnee for now, I am so proud that it was offered to her. Leslie’s ideas and dreams are often too big for Pawnee. Few people there share her level of passion for anything and the level of detail she goes into is overwhelming for most people. She cares about Pawnee more than anyone else does and gets rewarded for her passion by being recalled and getting called names. Since she’s been recalled, however, two outside people have recognized her value and told her to dream bigger. She’s not ready to leave Pawnee yet, but I think it’s moments like these that reassure her that maybe one day she will be because she was meant for more. While she didn’t get officially recognized in this episode, I want to recognize what a great character April has been this season. She has embraced everything that Leslie has taught her while maintaining her sense of identity. Orin still amuses her way more than Leslie finds normal and she’s still more cynical than Leslie, but she’s gotten so involved and has contributed so much to Pawnee lately and that is largely because of Leslie’s mentorship. April lying to Leslie about the good news so she’d have a moment of happiness is such a “Leslie” thing to do, and I loved her for it. I’d also like to recognize Chris Pratt’s wonderful gift for physical comedy. Andy trying to crash through the wall like the Kool-Aid man was hilarious, as was his open defiance of the bees. Ron’s plot this week served largely to reinforce the importance of doing something you are passionate about regardless of how others perceive it and also to provide many cute shots of his newborn son, and I’m okay with that. It was still a cohesive story for the episode, and the little bit we got of him interacting with John was adorable. I think this show has come back from hiatus stronger than it was before. Every week, I’m reminded of how happy I am to be a fan of this show. It’s grown comfortable with its characters without feeling stale, while giving us new characters like Craig to love. This entry was posted in Heather's Thoughts, Television, TV Time and tagged heather, parks and recreation, recaps and reactions, television by Katie. Bookmark the permalink.